Leeds United earned a battling point at Bolton Wanderers in a tale of two penalties at the Macron Stadium. Rudy Austin gave United a flying start with a third minute penalty only for Eidur Gudjohnsen to reply for the hosts from the spot in the third minute of the second half. Neil Redfearn’s side survived some big first half pressure, but deserved their point and could have come back with all three after the new look line-up responded to the changes the head coach made. Redfearn kept several of the players in from the Sunderland FA Cup tie and brought back Giuseppe Bellusci in defence with Lewis Cook returning in midfield, Sam Byram given a new midfield role and Steve Morison restored up front in place of Mirco Antenucci. 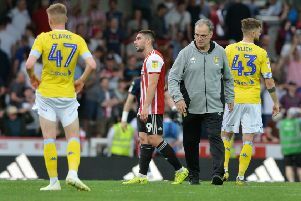 Leeds started strongly and were soon awarded a penalty after Byram raced through only to be brought down by the onrushing former United keeper Andy Lonergan. Austin stepped up to the spot and sent Lonergan the wrong way to give his side a perfect start. Leeds looked to build on it and were almost two up soon after as Morison met Byram’s cross only to see his header well saved by Lonergan. Bolton finally got into the game and centre-back Matt Mills headed just wide from a corner. Gudjohnsen was also narrowly off target with a free-kick and the home team began to exert more pressure. Charlie Taylor had to clear off the line to keep Bolton out following another corner and Liam Feeney saw an effort saved by Marco Silvestri after not getting much of a clean contact on a chance at the far post. Leeds’ defence held firm, however, and went in at half-time with their lead intact. They could not repeat the feat after the break, though, as the hosts were level within three minutes as Gudjohnsen beat Silvestri from the spot after Luke Murphy appeared to mistime his challenge for a 50-50 ball just inside the box to bring Darren Pratley down. United buckled down, however, and did not let the setback affect them as they remained solid defensively and began to get forward again. Cook hit a shot straight at Lonergan and Murphy fired just wide after more good work by Byram, who was enjoying his more advanced role. Gaetano Berardi then pushed forward from right-back, but was unable to make anything of a half-chance following Cook’s flick. Casper Sloth smashed a shot over from Berardi’s low cross while at the other end, Liam Cooper did well to block Gudjohnsen’s volley. Lonergan saved again for Bolton from Byram and the game ended with honours even. Head coach Redfearn was happy with his side’s display and pleased to have taken four points off Bolton this season. He said: “I thought we applied ourselves really well. It was a great battling performance from start to finish and with the chances we created we could have had all three points. “We needed a competitive edge. We needed to be solid. We needed to be aggressive. I wanted us to be able to compete in midfield areas. “And I wanted legs to be able to get up and around the front. I didn’t want to leave Steve Morison isolated down the middle. Bolton: Lonergan, Vela, Mills, Dervite (Wheater 66), Ream, Trotter (Davies 72), Danns, Pratley, Feeney, Gudjohnsen (Walker 90), Heskey. Leeds: Silvestri, Berardi, Bellusci, Cooper, C Taylor, Byram, Austin, Murphy, Cook, Sloth (Mowatt 85), Morison.